Dennis Romano — Patricians and Popolani: The Social Foundations of the Venitian Renaissance State. R.R. Palmer, ed. — The Two Tocquevilles: Father and Son, Hervé and Alexis de Tocqueville on the Coming of the French Revolution. Ben Forster — A Conjunction of Interests: Business, Politics & Tariffs, 1825-1879. Philip G. Nord — Paris Shopkeepers and the Politics of Resentment. W.L. Warren — The Governance of Norman and Angevin England 1086-1272. Chad Gaffield — Language, Schooling and Cultural Conflict: The Origins of the French-Language Controversy in Ontario. Alan B. Spitzer — The French Generation of 1820. James Pritchard — Louis XV's Navy, 1748-1762. A Study of Organization and Administration. Mark J. Stem — Society and Family Strategy: Erie County, New York 1850-1920. François Bédarida — Will Thorne. La voie anglaise du socialisme. Milda Danys — DP: Lithuanian Immigration to Canada After the Second World War. G. D. Ramsay — The Queen's Merchants and the Revolt of the Netherlands: The End of the Antwerp Mart, Vol. II. Wilfrid Prest, ed. — The Professions in Early Modern England. Harvey J. Graff — The Legacies of Literacy: Continuities and Contradictions in Western Culture and Society. 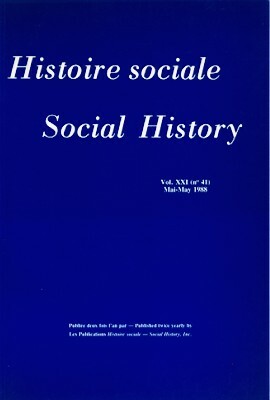 Rex Pope, Alan Pratt, and Bernard Hoyle, eds — Social Welfare in Britain, 1885-1985. Gay L. Gullickson — Spinners and Weavers of Auffay: Rural Industry and the Sexual Division of Labor in a French Village, 1750-1850. David Warren Sabean — Power in the Blood: Popular Culture and Village Discourse in Early Modern Germany. Robert Bothwell, Ian Drummond, and John English — Canada, 1900-1945. M.E. James — Society, Politics and Culture. Studies in Early Modern England. Jean Favier — De l'or et des épices: Naissance de l'homme d'affaires au Moyen Âge. David Sharpe — Rochdale: The Runaway College. Frank B. Tipton and Robert Aldrich — An Economic and Social History of Europe, 1890-1939. | Frank B. Tipton and Robert Aldrich — An Economic and Social History of Europe, from 1939 to the Present. Bernard Waites — A Class Society at War: England 1914-18. Arcadius Kahan — The Plow, the Hammer and the Knout. An Economic History of Eighteenth Century Russia. Robert S. Gottfried — Doctors and Medicine in Medieval England, 1340-1530. Kris R. Inwood — The Canadian Charcoal Iron Industry, 1870-1914. Standish Meacham — Toynbee Hall and Social Reform 1880-1914: The Search for Community. Jay Cassel — The Secret Plague: Venereal Disease in Canada, 1836-1939. A.B. McKillop — Contours of Canadian Thought. J. F. Bosher — The Canada Merchants, 1713-1763. Caroline Brettell — Men Who Migrate, Women Who Wait: Population and History in a Portuguese Parish. | Jan Lucassen — Migrant Labour in Europe 1600-1900: The Drift to the North Sea. Hartmut Kaelble — Auf dem Weg zu einer europischen Gesellschaft: Eine Sozialgeschichte Westeuropas 1880-1980. Nancy Shields Kollmann — Kinship and Politics: The Making of the Muscovite Political System, 1345-1547. Janet L. Polasky — Revolution in Brussels 1787-1793. Steven L. Hoch — Serfdom and Social Control in Russia: Petrovskoe, a Village in Tambov. Deborah Dwork — War is Good for Babies and Other Young Children: A History of the infant and Child Welfare Movement in England 1898-1918. Howard P. Segal — Technological Utopianism in American Culture. Login to access subscriber-only resources.